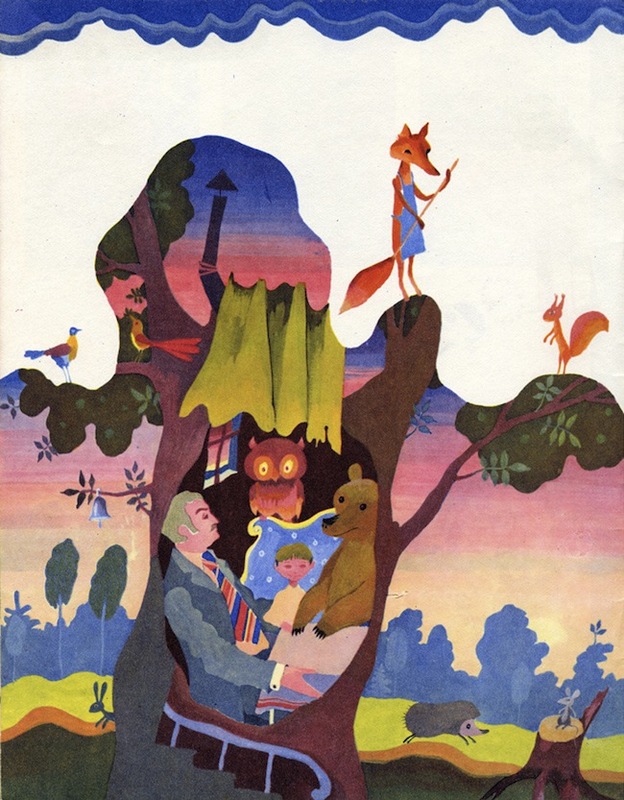 Now it’s clear that golden age of children’s books illustration of 1970s in USSR mostly occurred due to lack of freedom and ideological pressure in art and in the country. Turning to commercial art was a reluctant way to make more money and keep on the float in creative life and, sometimes, life in general. Like OBERIU poets and many illegal artists in 1930s. In early 1960s ideological body of the old Soviet dinosaur wreathed in more and more wrinkles, giving nonconformists place to hide. Artists took their opportunity to find some relative freedom. For example, Yury Sobolev, a significant person of nonconformist art, became art director of publishing house Znaniye (Знание), later, of magazine Znaniye - sila (Знание – сила). In the late 1950s, after finishing their studies, artists Ilya Kabakov, Erik Bulatov, Oleg Vassiliev and a bit later Viktor Pivovarov begin to work at the publishing houses Detskaya Literatura (Детская литература) and Malish (Малыш). And these are just few figures of Moscow nonconformist art that have worked as book illustrators. This is where professional features of Ilya Kabakov have developed and have helped him to become the most influential Russia artist of 1990s. Besides his huge working efficiency he was also always ready to quickly deliver the result to the customer. Kabakov writes in his book that he did five, six, sometimes, eight books per year, and it took him a month, and a half in the entire year. In the early 1980s he had illustrated several hundreds of books. Probably, that’s why he exposes himself in the last paragraph of his memoirs, “If one could measure the passion one puts into picturing a rabbit, many of artists would be busted. But, thanks God, we can’t measure it, so the material gain from the rabbit, drawn without passion and the rabbit drawn with love, is equal”. In relation with work of the artists in books or journals illustration an underexplored theme of economy of Soviet art, both its official and unofficial parts. 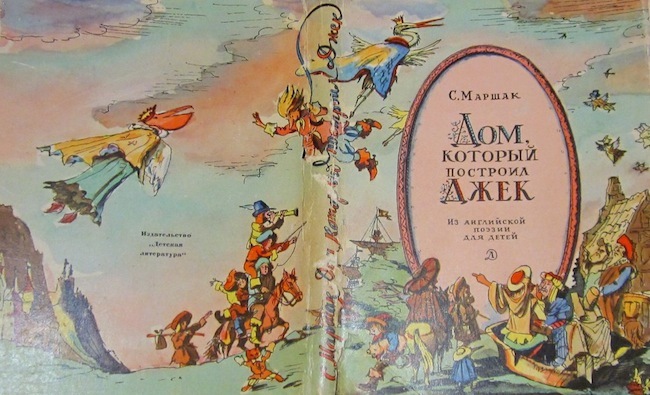 By the memories of illustrators it becomes clear that an artist could make on 16 pages thin children’s book as much as a Soviet worker made per year, which is about 1,500-2,000 roubles. Ilya Kabakov built his workshop of on Sretensky Boulevard in 1968 for money he made on illustration for children’s book House that Jack Built. In his memories Kabakov mentions the received honorarium of 4,000 roubles, whereas builder’s team asked for 2,800. Erik Bulatov and Oleg Vassiliev have also built their workshops in the same district, and they also made that money by illustrating children’s books, in their case it was Cinderella. The House that Jack Build of Kabakov is a book of English children’s poetry translated by Samuil Marshak, 200 pages, cover with bicolour letters, wrapped in dust jacket, with coloured and black-and-white pictures. One of the illustrations to the title poem has a recognizable author’s style: structure of the list, balance between background and the picture, it all reduplicates artist’s main discoveries in serious graphics. The illustration was evaluated by how many figures are in the picture, that’s why there were so many details and characters in the illustrations of Kabakov. The look from above is a typical approach of the artist, developed in children’s books even before he used it in his famous album series Ten Characters. Several Kabakov’s big paintings of early 1980s, including Bug, which gained popularity after record-breaking sell at Philips de Pury auction, are nothing more than books illustrations magnified to 2 metres, drawings transferred from paper to plywood. Kabakov describes them as magnified commercial kitschy pictures. This is when I discovered, tells the artist, that almost natural everyday object can be touching and educative on one hand and just dead commissioned thing on the other. Like old broken plywood planks that cover some crook fences, so generals don’t see holes, or so children don’t get away (if the drawing is for kindergarten, like this one). 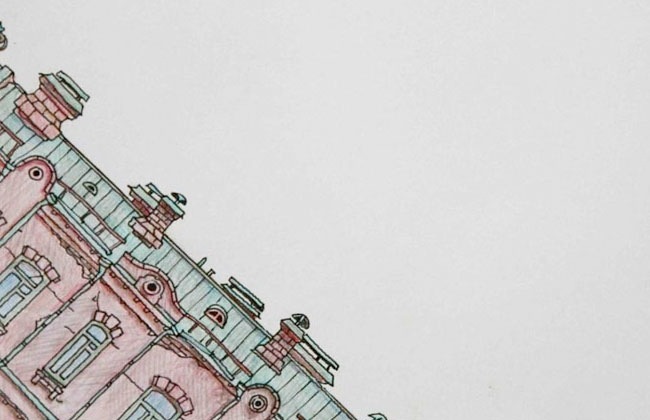 The artist flew away from illustration industry as soon as he had chance. He left the annoying commercial drawing and never came back since 1986. He has shown his true attitude towards illustrator’s work in his series of lithography circa 1993. 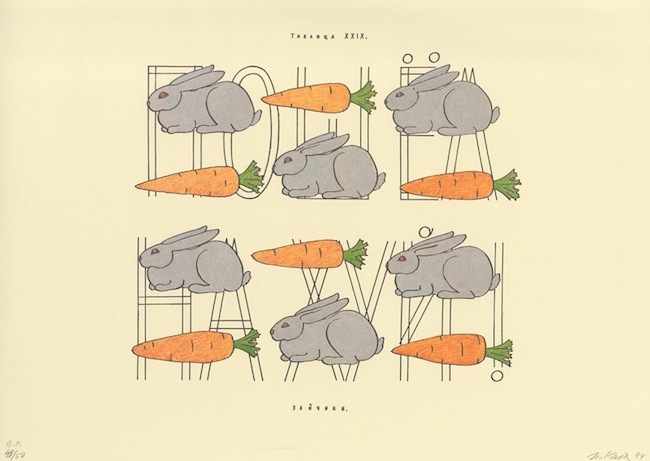 Pattern of rabbits and carrots, seagulls and ships covers clearly visible obscene swearwords. This is how artist placated his attitude towards the entire Soviet civilization that helped him gain popularity. Along with Kabakov, another children’s books illustrator is often mentioned, it’s Viktor Pivovarov. Unlike his previously mentioned colleague, he considers his work for children’s book an important part of creative work. Books illustrated by Pivovarov are really filled with warmth. He enlivened his commercial work, and unlike many other artists, really cared about content of the book. For me, illustration is at a certain degree objectification of illusions, illusions of my childhood and utopias of my matureness. It is very much because I tend to bring allegory into children’s illustration, it is complicated poetic point of view, he says. This Pivovarov’s devotion to book illustration industry can be explained also with biographical reasons. He graduated from Moscow Polygraphic Institute. His wife Irina Pivovarova wrote poetry and prose for children, she is still one of all-time favourite children’s poets. In the mid 60s Pivovarov’s drawings appear in the magazine Veselye Kartinki (Весёлые картинки), and since then he is collaborating with it (the logo of the magazine circa 1979 is also Pivovarov’s work). The first big book with his illustrations was children’s novel A Little Spider and the Moonlight. 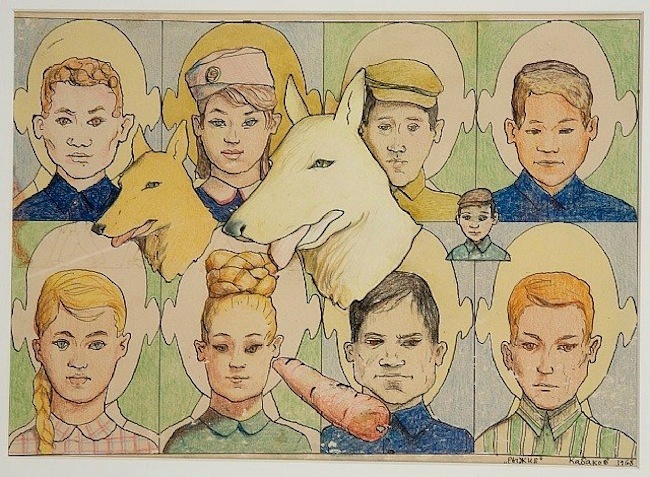 In the mid 70s Viktor Pivovarov was not only a well-known illustrator, he became popular and fancy author. He makes illustrations for Andersen’s tales and portraits himself in the wizard Ole Lukoje. These are words of artist: “It is easy to define what a children’s book should be like. First, it has to be opened for everyone to enter. Second, when you enter, everything should be good inside”. Spoken by a truly good wizard. There is a resident character in his books, a little mousekin, author’s alter ego. He remains also in Pivovarov’s paintings and memoirs Grey Notebooks, where he describes his life on behalf of mousekin Filimon. 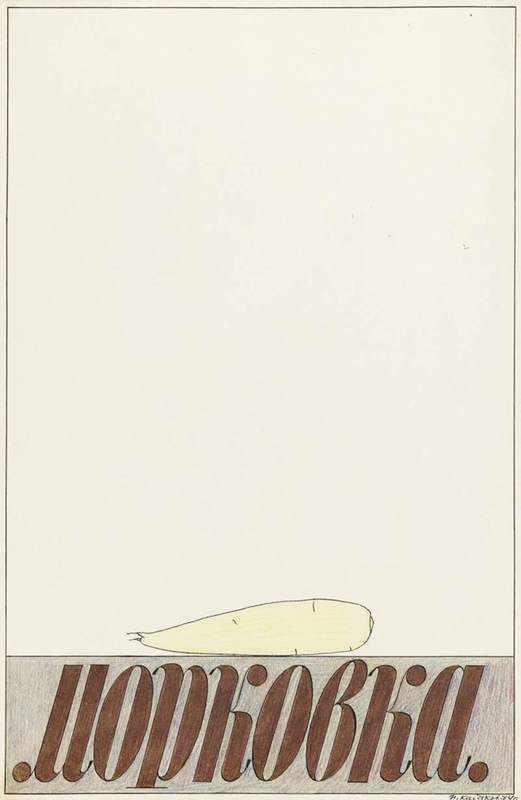 Which is interesting, in Ilya Kabakov’s book there is a similar character, a fly. Everything I do is about childhood, tells Pivovarov time and again. And it is too. 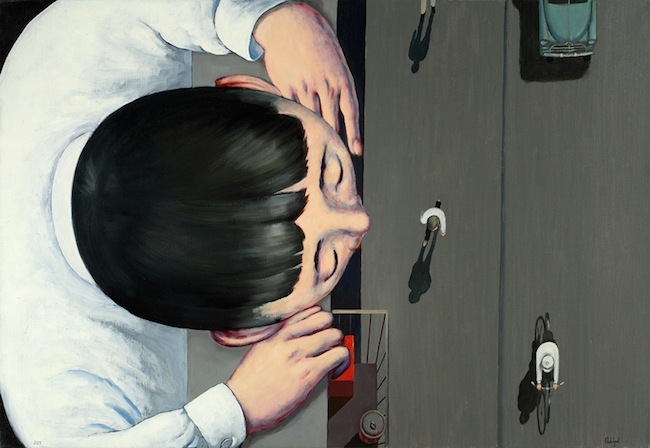 Paintings, installations, album drawings of Pivovarov: all his grown-up works have to do with children’s illustrations in terms of art. Illustrations for children’s poetry of Ovsey Driz in translation of Heinrich Sapgir are full of recognizable portraits. Later artist’s friends appear in the album Sapgir and Holin (2005) and pictural installations from the cycle Haven`s Chelm (1988) named after poem of Ovsey Driz. 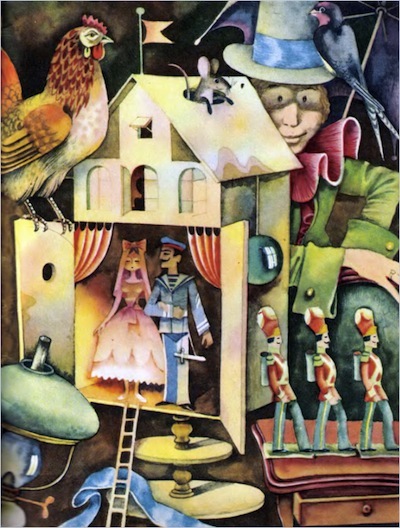 His work in children’s illustration reluctantly ends when Pivovarov leaves for Prague in 1982, and artist still regrets it. These 30 years, from 1956 till 1986, are an entire chapter in the history of children’ illustrations and all the Soviet art. 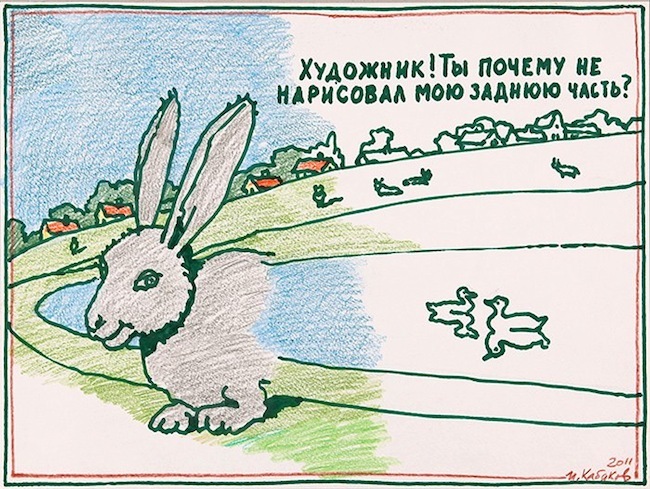 It has begun even before Moscow Conceptualism, which was named romantic by Boris Groys, and, probably, this is the most suitable term for children’s book illustrations.